WASHINGTON (Reuters) - The U.S. special representative for North Korea held three days of talks in Pyongyang to prepare a second summit to be held this month between President Donald Trump and North Korean leader Kim Jong Un, the State Department said on Friday, while giving no indication of any progress in the meetings. 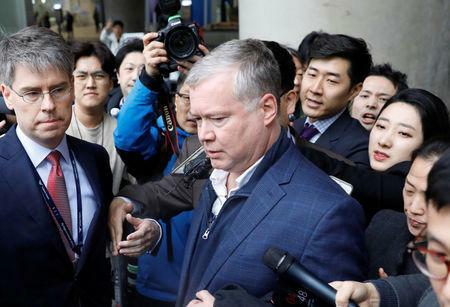 In their talks in Pyongyang from Wednesday until Friday Biegun and Kim Hyok Chol "discussed advancing President Trump and Chairman Kim's Singapore summit commitments of complete denuclearization, transforming U.S.-DPRK relations, and building a lasting peace on the Korean Peninsula." the State Department said. Its statement, which referred to North Korea by the acronym for its official name, the Democratic People's Republic of Korea, gave no indication of any progress in the talks.